Text: Mike Sullivan internationally since 2010 and her work encompasses an impressive range of materials and crafts. Besides furniture she has also used brass and steel to make mirrors, glass and burnt wood to create glasses with a beautiful impression that the glass is dripping slowly over the wood and even vases manufactured from jesmonite (a gypsum-based material in an acrylic resin). I’m a finnish designer with a strong background in Arts and Crafts. I studied Fine Arts and Product Design in Finland before moving to Stockholm and continued to Beckmans College of design. I graduated with a Bachelor in Product Design in 2011 and has since then worked actively with exhibitions and various collaborations both in Scandinavian but also overseas, for instance in Taiwan, Italy and Germany. At the moment I’m in a half way of my two years Masters at Konstfack University in Stockholm. Please tell us what your typical day is like. I love the early mornings more than anything! The silence and stillness of the hours of dawn are incredible inspiring and those moments spend alone deeply concentrated are the key to a productive day. During the day I like to switch from a task to another quite rapidly, from the ceramic studio to the library doing research, from my writing desk to a meeting or from the glass studio to a cafe at the downtown doing some daily mailing. I usually spend quite long days at the studio and I do enjoy every hour of it! Often I even call my studio a home by accident. Could you tell us about Helsinki? What do you like about it? I truly love that city! For the past five years I have lived in Stockholm and I enjoy traveling and getting inspiration from different parts of the globe but Helsinki is where my home and heart is. It’s a beautiful mixture of Russian influence and central Europe touch, a blend of old and new, urban and green – all in a compact package. I like the face that you can sense the presence of the sea in every street you walk on. All the different parts of the city has really unique characters and you don’t have to walk more than 20 minutes from for example Punavuori, the part with old national romantic houses and cosy narrow streets to Kallio, a young urban neighborhood with something new and unpredictable happening behind every corner. Please give us your recommendations for visiting in Helsinki. 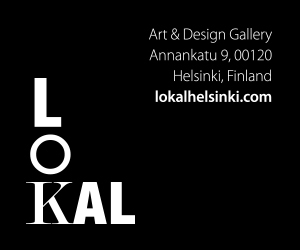 My favorite spots are Lokal, a dynamic and sympathetic gallery with a monthly changing unique collection of the most beautiful Finland in form of objects and art work. Design Forum Finland presents more commercial up-to-date part of the design field in Finland. I like the small antique shops in Kruunuhaka where the grey-haired shop-owners call tell you stories of every single object for hours and hours. More than everything I love the walking in Helsinki. Keep following the shore line and see the change happening in the city. During the wintertime make the walk on ice. Visit the market squares and old food halls, especially Hakaniemi. For more food I would advise getting to Teurastamo, a previous abattoir. Used for wholesale in the recent years, the historical compound is now being taken over by citizens. From there you can find a fantastic restaurant called Kellohalli, but also some shops and unique small scale events around food culture in Finland. For some fine dining book a table from Savoy or Toca. For a drink after go the Hotel Torni and head up to the bar terrace in the top floor.